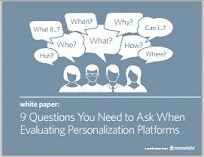 So how do you decide which personalization platform is best for you? The best way to find out is to ask your prospective vendors a lot of questions. This eBook lists nine questions you should ask before making your decision.